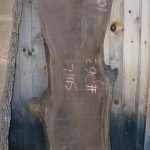 Live Edge Walnut Slab (swl#263) - Goosebay Sawmill and Lumber, Inc. This is a beautiful piece that features some crotch figuring. It has been kiln dried. The slab is 2 1/2″ thick. It measures 28″ to 38″ in width and is 103″ in length. This is the last piece from the log.